Mobile marketing and digital advertising are just getting more complex and harder. There is no shortage of vendors who would like to give you advice … but they have a conflict of interest. That’s why it can be so valuable to learn from a brand-side marketing peer. I recently visited the Mayo Clinic’s Jacksonville campus (an easy trip across the street from our headquarters) to interview marketing manager Ashley Testa. Ashley and her team generated 1,000% digital revenue growth at Cox Media Group before joining Mayo Clinic. Read on for six tactics to improve your own mobile marketing efforts based on her career experience. I’ve interviewed many marketers, and our careers are rarely a straight line. My most recent interview is a great example. Ashley Testa worked in sales at Cox Media Group (CMG) for over a decade. “Sales is actually the last profession that I ever imagined I would pursue. In fact, I even petitioned the dean of the business school for approval on opting out of a sales course,” she said. She was good at it though. In her tenure as Digital Sales Manager, the CMG sales team accomplished over 1,000% digital revenue growth. Today, as the marketing manager in Florida, she collaborates with Mayo’s teams in Jacksonville and Rochester, Minnesota, to tailor strategy around specific opportunities within the Southeast. Here are six tactics she has learned on her career journey to improve the effectiveness of mobile marketing and make a positive impact on the customer. Hopefully, these tips help you as you travel your own marketing journey. When you pay for a click on your mobile ads, your potential customers will get taken to a mobile landing page. The better that landing page is optimized for conversion, the lower your cost per acquisition will be and the higher your overall mobile paid search ROI will be. 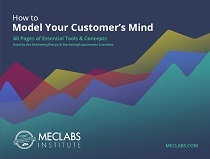 A key tool Testa uses for conversion optimization is the MECLABS Conversion Heuristic (MECLABS Institute is the parent research organization of MarketingSherpa). “I am a huge proponent and fan of the MECLABS Conversion Heuristic,” she said. Testa taught the heuristic in her recent presentation at the 2018 Mayo Clinic Social Media Network Annual Conference entitled “Energize Your Digital Ad Campaigns to Improve Performance and Conversions.” The landing page portion included an interactive exercise built around the heuristic. “Attendees loved having a more objective tool to use,” Testa said. With a mobile landing page, obviously, there is less space to communicate with the customer. “Making sure that your value proposition is clear on the top of the page can be even more challenging on mobile, especially depending on the header image,” Testa said. Friction is another important element to account for that is especially painful on mobile. Testa recommends (1) looking at checkout processes for desktop and mobile side-by-side with a screenshot for every step of the process, and (2) considering how friction may be experienced by the customer for each device type through those processes. Going one step further, when she worked at Cox Media Group she would even detail out the funnel for competitors and compare friction in the process side-by-side for each step of the conversion process. 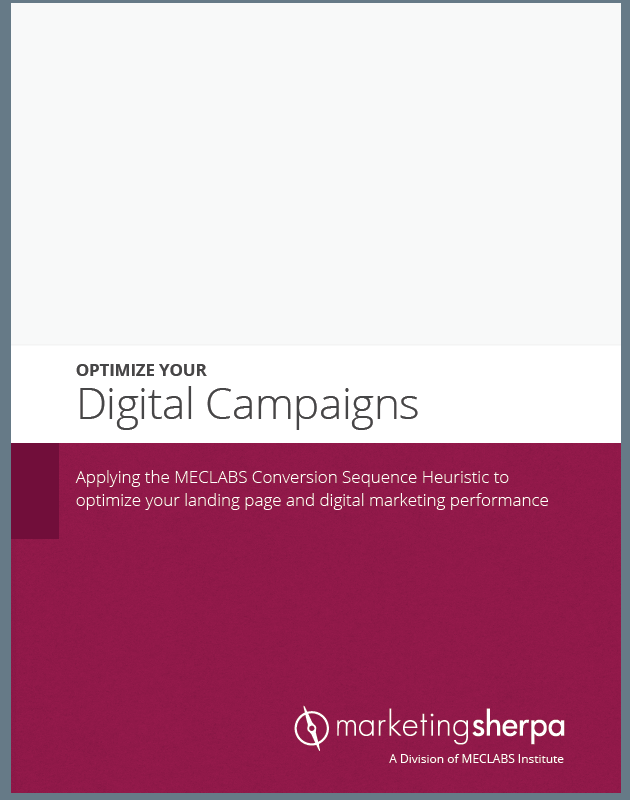 To implement the conversion point of your own digital campaigns, the landing page, you can download the landing page optimization worksheet Testa gave to attendees of her conference session — free instant download, no form fill required, just click this link — and apply it to your own landing pages. “[I learned of MECLABS] shortly after college graduation through online research. I was immediately inspired by Flint McGlaughlin’s mission to drive digital marketing decisions through real science. While A/B testing has been around since the evolution of digital, MECLABS brings things to the next level in several ways, such as the consolidation of research into repeatable methodologies, like the MECLABS Institute Conversion Sequence Heuristic,” Testa said. Testa first used the heuristic in a very offline medium — selling radio ads. She would work with her clients to ensure the radio ads were driving customers to optimized landing pages to increase the probability of conversion. It helped differentiate her from other sales reps because it drove results for her clients. Later, when she was in a digital role, she would provide it as a resource to her clients, and even use the heuristic to help analyze their funnel and how it compared to the competition. Showing how the competition was doing it better was a big driver to implement changes. “It’s a tool that I have used at literally every step of my career. It allowed me to achieve better results for my clients as an Account Manager by using it as a guide to optimize their landing pages, and the same at a larger scale when I moved into the Digital Sales Manager role at Cox Media Group where we were able to expand its use across our team, and then here at Mayo Clinic,” she said. Tactic #2: Get the basics of mobile paid search ads right. They are easy to skip. Mobile cannot be an afterthought for your paid search ads when advertising on Google. Not when two-thirds (65%) of paid mobile search clicks on Google occur on mobile devices (although that number is lower for Bing Ads [39%] and Yahoo Gemini [31%], according to Statista). Success on mobile paid search begins with a mobile-friendly landing page that is optimized for both conversion and quality score. “Ensuring that you have a great mobile experience is important, not just in terms of driving conversions, but also in relation to your quality score which, in turn, impacts your cost per click and the overall efficiency and success of your campaign,” Testa said. Two key technical aspects of your landing page that affect quality score are mobile load speed and mobile friendliness. These will also affect conversion. They can be gauged through the Google mobile-friendly test. There are other elements that are important for any ad, like a landing page that is relevant to your keywords. Another important technical aspect to understand is extensions, which can help increase quality score and conversions while giving your ad more real estate on those relatively small mobile screens. Extensions add additional information and functionality to Google Ads. 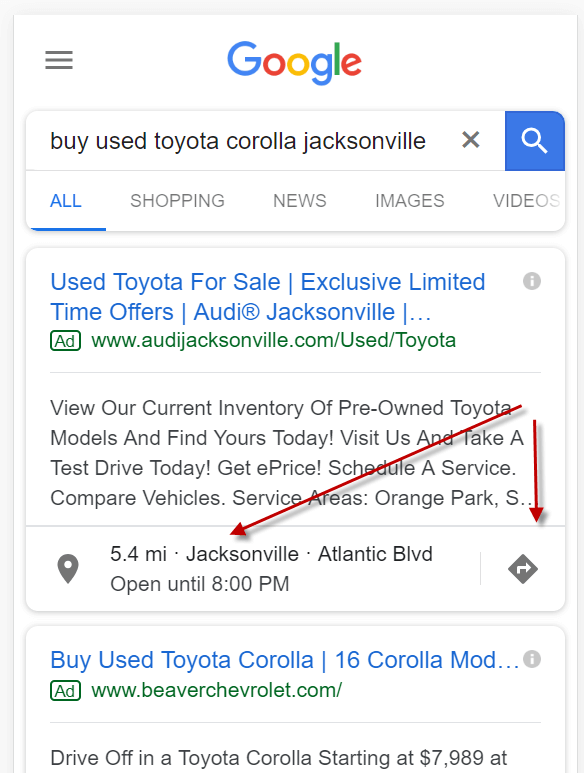 In the below example, the Google Ad extension on a mobile device shows the hours the brick-and-mortar store is open, the distance from the user, and it includes an action the user can take directly from the ad — a button to click for directions. Other extensions can allow mobile users to click to call or click to download an app, for example. “Extensions are critical with mobile because they help drive more immediate action when a user is searching and creates a better search experience for them,” Testa says. Extensions aren’t unique to mobile. 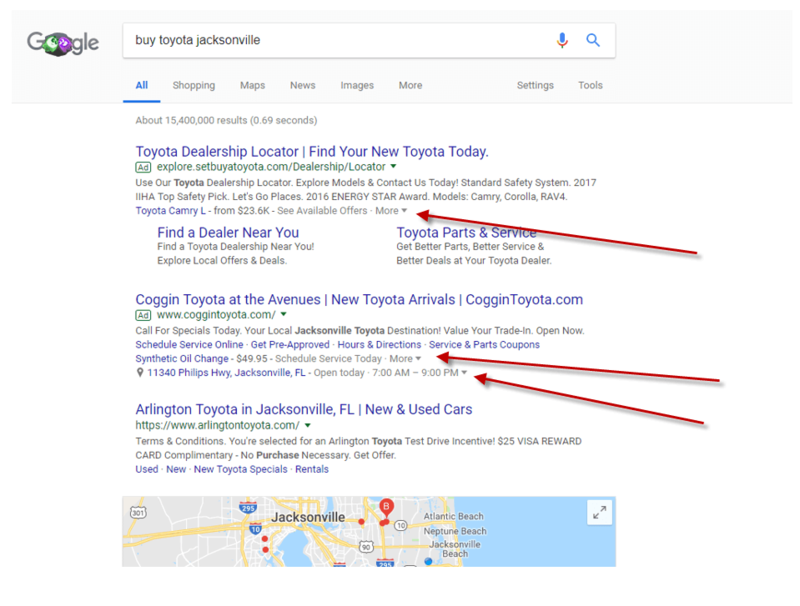 The below examples include Google Ad extensions for location, hours and price as displayed on a computer. Google customizes extensions displayed based on search intent, which is partially determined by the device you’re searching on. While the previous examples focus on brands with their own locations, affiliate location extensions can be used by marketers who sell a product by drawing attention to which retail stores the product can be bought in — for example, if you have a CPG (consumer packaged goods) product and your company sells it at Whole Foods and Trader Joe’s locations. When it comes to messaging, test your Google Ads to see what is most effective. Testa recommends you only test one variable at a time, go into the test with one clear metric in mind to gauge the test’s success, avoid other changes while the experiment/test is in place, and keep a record of past experiments and outcomes. (Editor’s note: The free Test Discovery Tool can help you log all the results and discoveries from your experiments). “With traditional media, you know exactly what you are buying — and the price reflects that. That is the case with digital as well, but the buying mindset varies. Buying at a more premium CPM (cost per thousand, from the Latin ‘mille’) can help to further hone in on the ideal target and secure inventory with higher viewability,” Testa said. And viewability is important because those impressions have value even when customers don’t click on your ad. While digital has gotten a leg up over traditional advertising like newspaper and magazine print ads because of its easy trackability and measurability, Testa believes some of the value of display ads is being overlooked when marketers only attribute value to them based on clicks, thus leading marketers to simply focus on the cheapest ads. Similarly, display has value when the right people see your ads even if they don’t buy or click right away. And when they do click, it can still be hard to directly attribute revenue to a digital display ad. Even if your website cookies the initial visit, your tracking can overlook conversions related to the ad since customers may click on the ad from their mobile device and then buy on their desktop. Of course, you only get the value from an impression if a potential customer sees it. This is one area where traditional and digital are very different — ad fraud. First, understand exactly what an impression is on mobile devices. According to Media Rating Council’s viewable ad impression measurement guidelines, a mobile ad impression is when at least half of pixels load on an in-focus browser or a fully downloaded, opened, initialized app, on the viewable space of the device, and the ad stays up for a minimum of one second after the ad renders (keep in mind, mobile often loads slower than desktop). This time requirement applies equally to News Feed and non-News Feed environments. A mobile video ad must meet the same viewability requirement and play for at least two seconds. If you have a smaller campaign with smaller sample sizes, it may not make sense to set up tracking, and you may have delivery issues if you start blocking several sites. In that case, at least ask the vendor you’re working with how they optimize around fraud — both in setting up the campaign and in monitoring it — and get examples of other campaigns they have run, along with how those campaigns compare against national benchmarks. For healthcare marketers specifically, Testa suggested they avoid retargeting around conditions because of patient privacy. “When a patient searches for a specific keyword themselves on Google, they expect to see results relevant to that term. In contrast, if that search triggers a keyword targeted display campaign, that ad will now display on a device that may or may not be personal. This can expose other people to a personal condition, and the patient themselves may not want to be reminded of a health issue on a consistent basis, as it may be stressful and life-altering for them,” she said. The benefit of mobile is that it tends to provide more contextual data than desktop, providing location information and not just characteristics and interests of potential customers. Consider how these customer insights relate back to how your brand can serve customers. “You have opportunities with mobile that are quite unique, especially with in-app campaigns where you can geofence and target based on current location or actual visitation patterns,” Testa said. She provided an example of campaign creative customized around mobile. If you have a restaurant that caters to families, you may want to geofence around schools and little league fields when kids are getting out of school. Your message might be about getting a healthy, quick meal during the work week for hungry kids. She provided another example: A chiropractor could have a message targeting golf-related spinal injuries served up to mobile users who visit golf courses. That extra context gives you the ability to communicate with precise imagery and messaging that can be helpful on mobile since there is much less space to get the message across. While marketers are very conversion-focused in their execution, the ultimate way to make all these mobile tactics effective is with customer-first marketing. In this sense, all marketers can learn a lot from the healthcare industry where helping patients make the best decision for themselves is at the core of all activity. Why should it be different than any other type of product? “Healthcare marketers need to employ a very high level of scrutiny to ensure that marketing is representative and transparent. This allows patients to truly have the best information possible to make an informed decision on where the best care is for them,” Testa said. So how does a marketer drive change that puts the customer first and ultimately gets results? It takes internal marketing. And like external marketing, it revolves around creating a prospect-level value proposition. “Spend the time to develop meaningful relationships and constantly communicate with your colleagues about how change will benefit them as an individual stakeholder because there will always be conflicting viewpoints. Every change is going to impact departments differently,” she said. Since change is so hard, you need to clearly paint the picture of how it will be a win for them and their department, she advises. “Always challenge the status quo — but do it in a way that brings the team with you verses causing tension or rifts. Position it as a win for everyone and bring everyone along with you for that win,” she said. This internal marketing is so important because, ultimately, all responsibility for performance rolls up to the marketer. “Take full accountability for results. While in most organizations, not everything is within Marketing’s control, you still have the ability to collaborate across departments to drive results — and enact the necessary changes to optimize your internal conversion processes and patient experience,” she said. Once you have a successful project, use it as a springboard for the next great customer-first change and for building further alliances by celebrating with your cross-departmental colleagues who helped make it happen. “Always take the time to ensure that those involved in impacting positive change receive the recognition deserved for their hard work. Sincerely thank them, inform leadership or their boss of their contributions, send handwritten notes, nominate for internal awards, etc. Have fun celebrating their success that makes up ‘our success,’” Testa concluded.